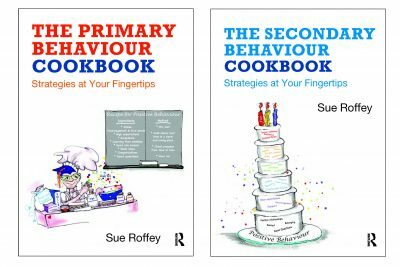 Developed in conjunction with practitioners and teachers, The Primary Behaviour Cookbook provides highly effective, practical strategies for responding to and resolving behavioural issues in primary classrooms. Social interactions: resolving problematic situations that occur between pupils. Behaviours of special concern: recognising behaviours associated with autism, trauma, or abuse. Underpinned by positive psychology, and emphasizing the importance of constructive relationships, communication, inclusion and child wellbeing, this is an indispensable resource for primary school teachers and assistants, behaviour support consultants, SENDCOs and educational psychologists. The Secondary Behaviour Cookbook will be published on 21 September 2018, but can be pre-ordered from Amazon here. First published as Circle Time for Emotional Literacy, this new edition has been updated to reflect how the Circle Solutions philosophy and pedagogy can be used to build relationships and resilience for children and young people. 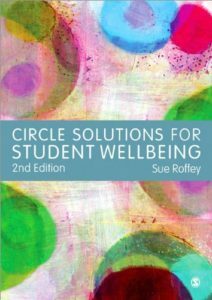 Putting current research on wellbeing into practice, Circle Solutions for Student Wellbeing addresses issues not incidents, solutions rather than problems, and strengths rather than deficits, providing a framework for student engagement and learning. Activities and games included in the book promote positive communication skills, empathy and connectedness, class cohesion and co-operation, friendship skills and ethical behaviour. The book is suitable for all phases of education. Order from Footprint Books in Australia, or Amazon.co.uk. With case-studies, checklists, suggestions for good practice and cartoons to illustrate and enrich the text throughout, this book is structured to be easily accessible and invaluable for those who are in training to work in the early years sector. It will also be of interest to students on foundation and undergraduate students on Early Childhood Education and childcare courses as well as more experienced practitioners. 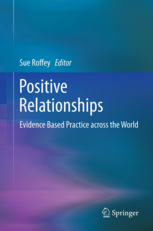 Positive Relationships: Evidence Based Practice across the World by Sue Roffey (Ed. ), Springer (2013) is available in both hardback and paperback and as a Kindle edition from Amazon. Relationships are threaded through every aspect of our lives, at home, at school, at work and at play. They are the foundation of our greatest happiness but can also be the cause of our deepest despair. Despite how crucial they are, we may not give much thought to relationships except when they go wrong – whether this is lost intimacy, violence in our communities or toxic working environments. There is something here for everyone in both their personal and professional lives – and for students who anticipate working with people in any capacity. Chapters provide a wealth of evidence on promoting optimal interactions between couples, friends, parents and children and community groups. Authors address positive environments at work and at school, mentoring relationships, a new paradigm for relational leadership and how to foster tolerance between people of different faiths. Others explore what is best for children after family breakdown, how to ensure that conflict is more about learning than losing and what might help repair relationships that are damaged. Authors are academics and practitioners from across the world providing both evidence-based practice and practice-based evidence. Examples and case-studies throughout each chapter illustrate what works. Overarching themes include seeking what we have in common rather than what divides us, fostering positive communication practices, building social capital and what it means to treat each other with respect. The science of positive psychology shows that relationships can offer real meaning and sustainable fulfilment in our lives. Knowing what promotes the positive is the first step to authentic wellbeing. Good teachers know that positive relationships with students and school connectedness lead to both improved learning and better behaviour for all students, and this is backed up by research. This book will show you how to promote positive behaviour and wellbeing in your setting. Taking an holistic approach to working with students, Sue provides examples of effective strategies for encouraging pro-social and collaborative behaviour in the classroom, the school and the wider community. Chapters look at the importance of the social and emotional aspects of learning, and ways to facilitate change. Read the Introduction chapter here. You can also read some reviews of Changing Behaviour here. 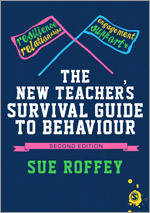 The New Teachers Survival Guide to Behaviour by Sue Roffey, Sage (Second Edition 2011). Foreword by Bill Rogers. This shows how new teachers might get maximum professional satisfaction by having an authoritative relationship with students. It suggests ways to deal with conflicts and confrontations which do not undermine a sense of self or purpose so that they become just part of the challenge, not the reason to dread Monday mornings. There are also ideas on maximising emotional resources – and looking out for supportive colleagues. See the (2004) chapter on establishing good relationships with your students, You and Your Class. This does not include Nic Watt’s great illustrations but you can see some of his excellent work and contact him here. You can read the Introduction chapter to the Second Edition here. This book shows how to establish good practice in early years settings so that all children are supported in developing positive interactions with one another. Sue explains the features of an ’emotionally literate’ environment in order to meet the needs of more vulnerable children and looks at how to respond effectively when children are distressed and hard to manage, providing plenty of ideas and inspiration throughout. Read the chapter Once again with feeling. For more detail see the Routledge site or Amazon, who also have a Kindle edition. Whole Child is a program for three primary levels with five themes: Emotions, Getting Along, Family and Community, Citizenship and Human Rights, Health and Wellbeing. Each theme for each level has two posters and a story to stimulate discussion and reflection. 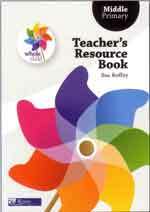 The teachers’ resource books (written by Sue Roffey) use guided questions and Circle Time activities to explore meanings for students. It goes to the heart of the individual within their class and their community. It addresses issues that are critical for our young people and their future – and the future of their world. 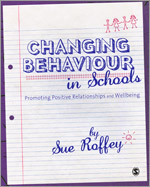 This book has been completely updated and rewritten for the new Primary Behaviour Cookbook. This book focuses on the relationship that school have with parents and carers, especially in the early stages of behavioural difficulty. It includes chapters written by contributors who have a special expertise in working with parents who harm their children, the carers of children in foster families and residential homes, mobile families and families from diverse communities. It aims to promote the best possible partnership with parents in what is often a sensitive and emotional situation. This book shows how teachers can encourage children to learn positive attitudes and engage in appropriate classroom behaviour from the outset. It considers ways to minimise disruptive behaviour and encourages a range of useful perspectives on behaviour and young children in school. These are supported by practical easy to implement strategies. This book has been ‘highly recommended’ by teachers in a survey for the General Teaching Council. UK. 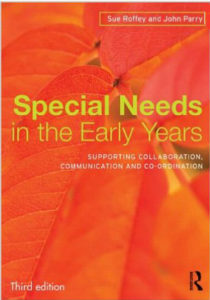 ” Here is an essential text for infant and primary colleagues. It is well written, realistic, practical and useful and readable … overall this is an excellent text, indispensable for infant teachers”– Bill Rogers. This book sets out to explore the different social contexts that children find themselves in at school. It aims to link principles and theory with practical application by providing a positive social climate in an educational setting. Now out of print.